SBUSDEF is holding its Casino Night on Friday October 9th at 4:30pm at Boys & Girls Club on Encina Ave. The South Bay Unified School District Educational Foundation is holding its Annual Casino Night on Friday October 9th from 4:30pm to 8:30pm at Boys & Girls Club at 847 Encina Ave. It directly supports the students of the School District! They're also seeking donations of raffle gifts, prizes, gift cards, gift certificates, and any items you would like to donate for the event. 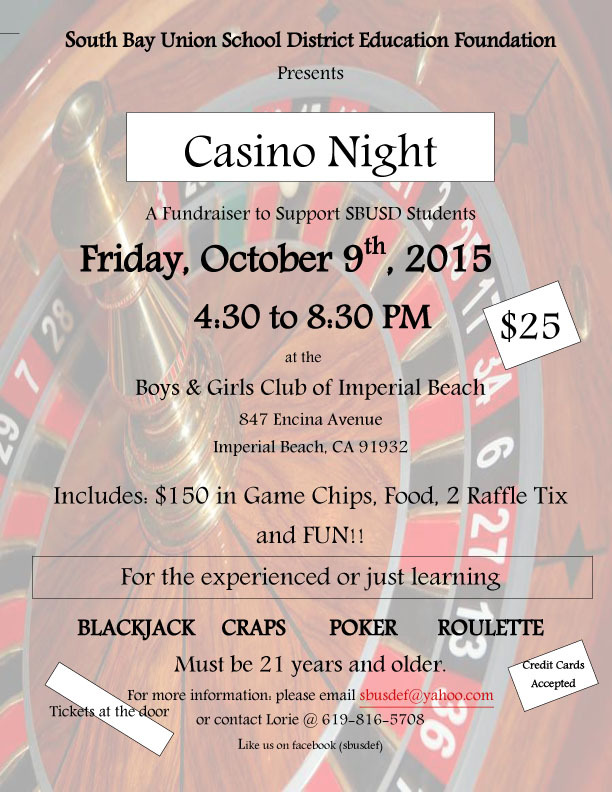 SBUSD Education Foundation is hosting our Annual Casino Night to raise funds for South Bay students. The South Bay Union School District Education Foundation is a non-profit organization that supports students of SBUSD. In the past, the Foundation has awarded over $50,00 in mini-grants to teachers across the district for programs and projects to enhance learning.